Penguin and Pinecone: What a cute little penguin! He has an orange, fuzzy scarf and bright yellow feet. 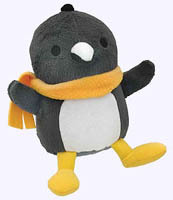 His big eyes, short beak, and round belly all add to the overall sweetness and charm of this small but substantial plush doll. A perfectly-sized companion for each day, he is a reminder that enduring friendships come in all shapes and sizes. Penguin is 6" tall. Penguin and Pinecone: When Penguin finds a lost pinecone one day, an unlikely friendship blooms. But Grandpa reminds Penguin that pinecones can't live in the snow - they belong in the warm forest far away. Though he will miss his friend, Penguin returns Pinecone to his home, dreaming of the day they can reunite. And when he finally returns to the forest to check on his friend, Penguin discovers that love only grows over time - and so do little pinecones! Penguin in Love: When Penguin finds a lost mitten on the ice one day, he wonders who it belongs to--after all, every mitten has a mate! Spare text and bright, energetic illustrations bring to life this endearing story celebrating love in its many forms, reminding us that the greatest adventure begins when you find your other half. Penguin on Vacation: Penguin is tired of the snow and cold, so he decides to visit the beach! But when his favorite activities like skiing and skating don't work so well on sand, can a new friend help Penguin learn how to have fun in the sun? Penguin's Big Adventure: Penguin embarks on his next journey-becoming the first penguin to explore the North Pole! Along the way, he says hello to all of his old friends. But when he finally reaches his destination, he realizes he's all alone in a strange, foreign place.... How will Penguin overcome his fears of the unknown and enjoy this new adventure?